The harvesting of timber and the scheduling of logging operations are determined by surrounding environmental conditions. In Wisconsin, extreme cold events during winter can impact equipment or make it impossible to operate. Regulatory practices can also impact the scheduling of logging operations. Logging equipment can adversely impact soil conditions and adherence to Best Management Practices will limit access to parcels in wet conditions. Similarly, the transport of harvested material over public roads is restricted during spring thaw to prevent costly damage to roads. Harvested material transport is limited during an approximate month-long period referred to as “spring breakup”. 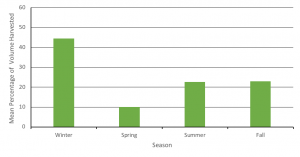 To better understand the impact that operational seasons have on the Wisconsin logging industry, we asked logging businesses responding to the survey on their 2016 production to estimate the percent of volume harvested in each season. Wisconsin loggers operated 3.5 seasons on average. As expected, firms harvested the highest average percent of volume (44%) during the winter (December 2015 – February 2016) and the lowest average percent of volume (10%) during the Spring 2016, from March to May (Figure 1). 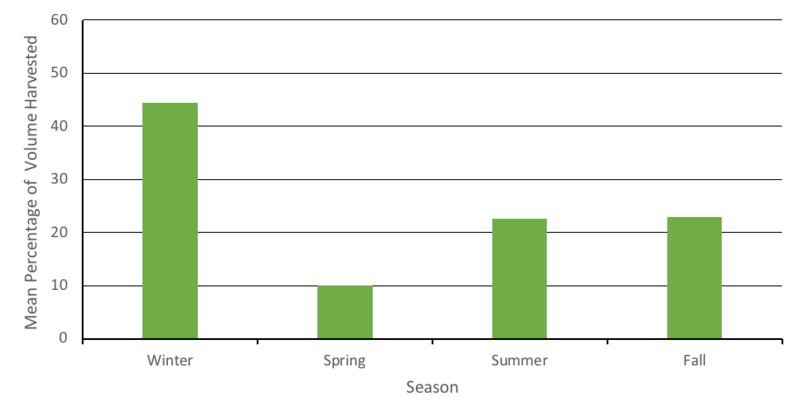 Summer (June – August) and Fall (September – November) each had a little over 22% average volume production. 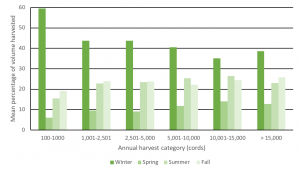 Producers of larger volumes appear to maintain a slightly more balanced average harvest percent over the seasons of the year, though there is still a slightly higher average in the winter and spring harvests ranging on average from 12 -14 percent. 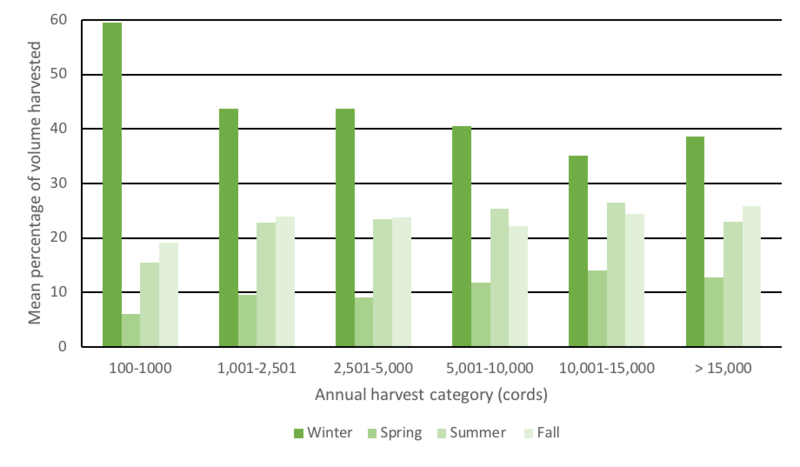 While producers in the smallest volume category (100 – 1000 cords) were most likely to harvest the highest percentage of that volume during the winter months, and then spread the remaining 40% average over the summer and fall, with a slight bit in the spring (Figure 2). We might expect that the average percent harvest by season might change be influenced by the timber type, where the northern hardwood timber types might be subject to more snowfall but also colder temperatures. 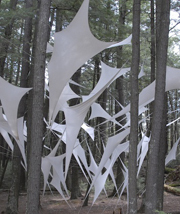 Therefore, we might expect some difference in the average percent of volume harvested in the northern region compared to the southern region, where the northern region is defined using USDA Forest Service Forest Inventory and Analysis Regions 4 & 5. 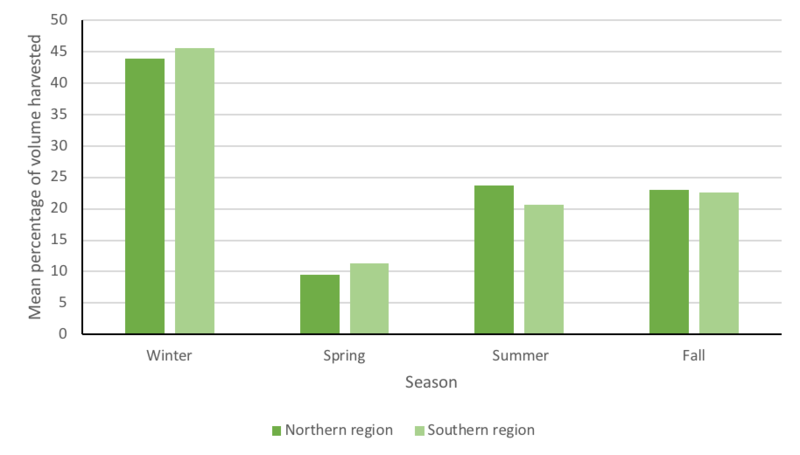 There are some differences, particularly during the summer months, where slightly more (~24%) average volume is harvested in the northern region when compared to the southern average of about 21%. 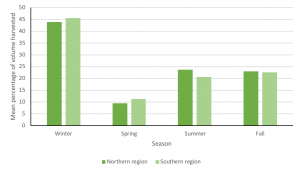 The regions were closest in their average volume harvested during the fall 2016 (September – November) at approximately 22.8% and 23.2% in the north and south, respectively.